Epson EH-LS100 laser projector delivers 130in image from 6cm | What Hi-Fi? Along with the laser EH-LS100, Epson has announced 12 new models - five of which are dedicated home cinema projectors, available late 2017. Epson has announced its first laser ultra short-throw projector, the EH-LS100. What makes it "ultra"? Well, it can be placed as little as 6cm away from a wall and still project an image that spans from 70 to 130 inches. Ideal if you're after a big-screen picture but haven't got too much space. The projector uses 3LCD technology and its resolution is 'only' Full HD, but it has an impressive, claimed 2,500,000:1 contrast ratio and 4000 lumens of brightness. That'll be handy in brighter rooms. It's also a laser-sourced projector (just like Epson's flagship EH-LS1000), which should give it a much longer life-span than conventional lamp-sourced projectors. It has three HDMI inputs (one of which is MHL-compatible for connecting smart devices), built-in 16W speakers, optional wi-fi connectivity, and you can even control it via an app. The Epson EH-LS100 laser short throw projector will cost £2600 when it's available in November 2017. Epson has also announced a long list of standard projectors - 12 models in total. Of those, the EH-TW610 (£600), EH-TW650 (£600), EH-TW5400 (£700), EH-TW5600 (£800), and EH-TW5650 (£900) models are "pitched at home cinema and entertainment enthusiasts", says Epson Europe's project manager Paul White. The rest are more suited to work environments. 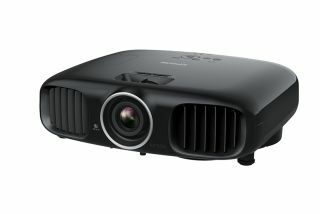 The five new home cinema projectors all sport Full HD resolutions (a little disappointing, perhaps, in light of Sony announcing more 4K projectors), with light outputs ranging from 2500 to 3100 lumens and contrast ratios ranging from 10,000:1 (EH-TW610) to 60,000:1 (EH-TW5650). They all feature 3LCD technology, have twin HDMI inputs, and, in the case of the EH-TW5600 and EH-TW5650, feature auto vertical lens shift correction. These new Epson home cinema projectors will be available from October 2017 onwards.